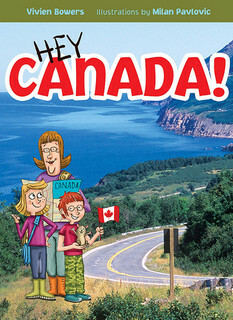 Back in the spring I was lucky enough to receive this beautiful book Hey Canada! 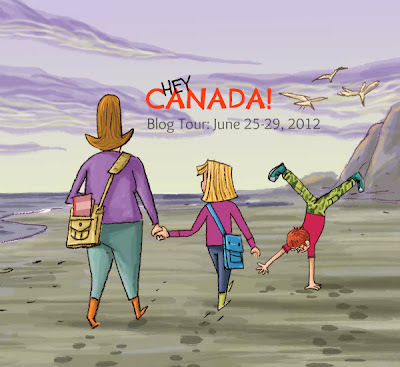 by Vivien Bowers The book is basically a blog in book form written by Cal and Alice, cousins, about their adventures around Canada with their grandmother. The book is a colourful reference book that will be utilized by my daughter in our homeschooling adventures. The bright illustrations and photos held the interest of both my 8 year old and some of the 3 and 6 year olds that are in my care from time to time. I love the find it feature that gran gives the kids for every province. Always great to give kids something to look for to see how observant they are. I use this tool often with our own children. We are also following Cal on twitter and I more than love the interactive aspect of this book and so does my daughter. She thinks the tweets are so neat. You can follow Cal on twitter here! Vivien Bowers was born in Vancouver, Canada in 1951, the second of four children. She received a B.A. in English (honours) from the University of British Columbia followed by a teaching certificate, and was a grade 5 teacher for several years in Nelson, BC. Vivien has been a freelance writer for more than twenty-five years, writing elementary and secondary school materials, as well as non-fiction books and magazine articles for both adults and children. She has been invited to do presentations on her children's books in hundreds of schools and libraries across the country. Bowers has two sons, now grown up, and lives at the base of the mountains outside of Nelson, BC. She loves to escape into the wilderness to ski, hike or canoe. To see other reviews of Hey Canada! Check out the list for the blog tour at Tundra Books! Disclosure: I received a copy of this book for review. In no way was I compensated for this review. The opinions are 100% my own.